Cossack No More. Sholokhov was born Mikhail Stefanovich Kuznetsov on May 11, 1905, on a farm near the River Don in Russia. This region was dominated by the Cossacks, a privileged group of people who were required to serve in the Russian Army. Neither of Sholokhov’s parents were Cossacks, but he was registered as a Cossack at his birth, due to his mother s marriage to an elderly officer who was not Sholokhov s father. After the old man died in 1912 and Sholokhov s father and mother were officially married, Mikhail lost his Cossack status. Effects of Revolution. Sholokhov attended a quality regional school in the town of Boguchar, Voronezh Province, but he was forced to leave because of the German invasion in 1918 near the end of World War I. Russia fought in the conflict on the side of France, Great Britain, and the United States against Germany, Turkey, and Austria-Hungary. Unlike its allies, Russia’s battles against Germany often ended in defeat and Russia lost considerable territory to Germany when a peace treaty was created between the two countries. Early Affinity for Communism. At the age of fourteen, Sholokhov was forced to make a decision that influenced the rest of his life. He joined the Communists (as the Bolsheviks came to be called) and went to work for the Revolutionary Committee. For a time, he served as a machine gunner with a Red Army supply detachment and volunteered to fight in a special forces unit. He also took part in the cultural life of the Don region, helping produce a daily newspaper and organize the local theater. 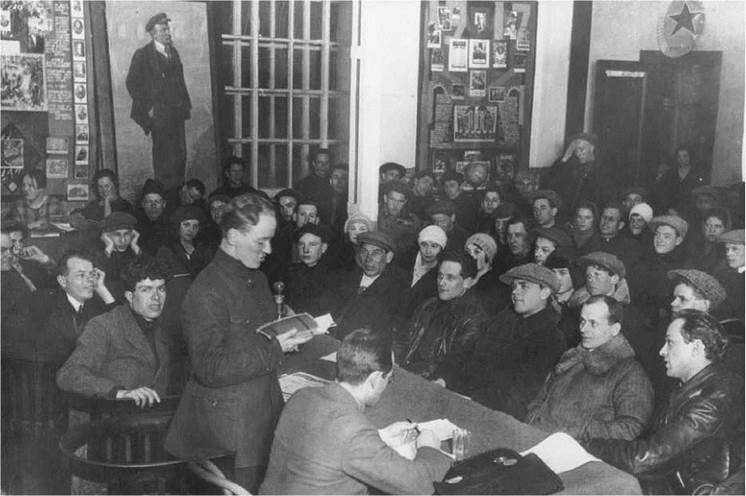 Captured and interrogated in 1920, Sholokhov was spared from execution. Wrote The Quiet Don. By the end of 1926, Sholokhov had two short-story collections in print and was gaining recognition for his writing. Working on his first novel in 1927, he realized that it needed more of a historical context for the average reader to understand it. Consequently, he began a description of the Don Cossacks prior to World War I, and this work became the starting point for The Quiet Don. Depicting Cossack life up to the Bolshevik Revolution, the first two segments of the epic were published serially in the journal October in 1928. Completed Epic. An English translation of the first two books of Sholokhov’s epic, And Quiet Flows the Don, appeared in 1930. The author ran into censorship problems with the third book, which describes the actual events of the 1919 uprising. According to the most cited version of events, Stalin ordered that publication proceed following a meeting with Sholokhov and leading Soviet author Maxim Gorky. Part seven of The Quiet Don was serialized in 1937 and 1938. Stalin held up the final installment, insisting that the hero convert to Communism by the end. Sholokhov objected and surprisingly won the standoff. Part eight was published, its ending unchanged, in 1940. A Survivor. Because Stalin believed that the Soviet Union had to be able to feed itself, he mandated the transformation of Soviet agriculture from individual farms into a system of large collective farms. With Stalin’s help, Sholokhov published the first book of his novel Virgin Soil Upturned, a powerful yet objective account of Soviet collective farming. At risk of being named an enemy of the Party, Sholokhov courageously pointed out both benefits and detriments of collective agriculture, presenting the stories of dispossessed Cossacks and peasants. Still, he remained a party loyalist and believed that collectivization would ultimately benefit Russia. A Communist Nobel Prize. While some renowned Soviet literary figures became targets of vilification, Sholokhov’s position in the party grew stronger. He served publicly as a government spokesperson, even while his own writing was embroiled in censorship battles. He was forced to revise The Quiet Don drastically; amended versions appeared in 1952 and 1953. After Stalin’s death in 1953, the original text was mostly restored. Boris Pasternak (1890-1960): Author of Doctor Zhivago (1957), this Russian novelist and poet won the Nobel Prize for Literature in 1958. Mikhail Zoshchenko (1895-1958): Zoshchenko was a popular Soviet novelist and satirist whose books include Nervous People (1927). George Orwell (1903-1950): This English novelist and essayist is the author of the political classics Animal Farm (1945) and 1984 (1949), depicting the consequences of totalitarianism. Evelyn Waugh (1903-1966): Many novels by this English satirical novelist parody British aristocracy and high society, including Decline and Fall (1928) and Brides- head Revisited (1945). Sergei Eisenstein (1898-1948): Eisenstein was a Soviet film director famous for his use of montage in silent cinema. His films include Strike (1925) and October (1927). Leonid Brezhnev (1906-1982): From 1964 until 1982, Brezhnev was general secretary of the Communist Party, the leader of the Soviet Union. The Iliad (eighth century BCE), an epic poem by Homer. Relating events of the Trojan War, The Iliad is considered by many to be the oldest work of European literature. Les Miserables (1862), a novel by Victor Hugo. Hugo's famous sentimental novel follows several French characters through the Napoleonic Wars and subsequent years. War and Peace (1865-1869), an epic novel by Leo Tolstoy. This massive, triumphant work of literature encompasses the story of Russian society during the Napoleonic era. One Hundred Years of Solitude (1967), a novel by Gabriel Garcia Marquez. A masterpiece of Latin American magical realism, this novel depicts a century in the life of a town and its founding family. The Red Wheel (1971-1991), novels by Aleksandr Solzhenitsyn. This cycle of historical novels covers moments in Russian life during the First World War. Socialist Realism. Sholokhov’s artistic success within Soviet society has much to do with his application of the conventions of socialist realism, the required genre of all literature under Stalin. The Quiet Don demonstrates the principle of historical inevitability, in which people must either adapt to or be destroyed by historical forces. Sholokhov championed socialist realism, claiming in his Nobel Prize acceptance speech that ‘‘it expresses a philosophy of life that accepts neither a turning away from the world nor a flight from reality.’’ At the same time, Sholokhov resisted efforts to alter the political ideas in his work and did not shy away from objectively describing the problems and even tragedies that accompanied the Soviet revolution. In his best work, political doctrine is artfully fused with the requirements of his narrative. At other times, rigid adherence to the party line is seen as compromising his work’s literary merit. The Best and the Worst. In the Soviet Union, the Communist Party’s efforts at social control meant that literature and all the arts took place in a highly politicized cultural context. The early reception of Sholokhov’s epic demonstrates this. Since Sholokhov was not yet a party member, he was open to political attack. The more orthodox Communist critics branded Sholokhov a peasant writer who did not sufficiently highlight the plight of proletarians. They questioned why he took the perspective of the defeated White Army and not the victorious Bolsheviks. 1. Why do you think Stalin relented and allowed Sholokhov to publish part eight of The Quiet Don without revising the work so that the hero converted to Communism by the end? When you consider the fact that writers and artists were often executed for challenging the Communist regime, what is more important: ignoring the censorship of socialist realism and remaining true to one’s art, or complying with the edicts of such tyrannical rulers as Stalin? Write a paper that outlines your conclusions. 2. Sholokhov’s Communist critics objected that the author wrote The Quiet Don from the perspective of the White Russians rather than the Bolsheviks. What does the work gain or lose as a result of Sholokhov’s decision? What might have happened—critically, socially, politically—if Sholokhov had written from the Bolshevik point of view? Create a presentation of your findings. 3. Aside from an allegiance to Communism, what specific social or political values does Sholokhov champion in his prose? What distinctions can you make by assessing Sholokhov’s work on purely literary terms, leaving aside political considerations? Write an essay that outlines your views. 4. Research the collectivization of Soviet agriculture under Stalin for a presentation. Does Virgin Soil Upturned fairly portray the impact of this Soviet policy? Do you agree with socialized farming? Explain your answers. Slonim, Marc. Soviet Russian Literature: Writers and Problems, 1917-1977. London: Oxford University Press, 1977. Salisbury, Harrison E. ‘‘Khrushchev Bid to Sholokhov Follows a Dispute over Novel.’’ New York Times, September 1, 1959, 1, 6. Simmons, Ernest J. ‘‘Muddy Flows the Don.’’ New York Times Book Review, August 20, 1967, 28-29. Solzhenitsyn, Alexander. ‘‘Sholokhov and the Riddle of The Quiet Don.’’ Times Literary Supplement, October 4, 1974, 1056.